A range of specially formulated solvents designed to mix with its compatible paint or coating to create the optimal consistency for application whether it be for brush, roller or spray. They can also be used for the cleaning of some surfaces prior to application and application tools after use. Don't be tempted to cut corners with a generic solvent such as 'gunwash' to try and thin and clean everything all in one, choosing the correct thinner is more important than you may think and pays dividends in the end. 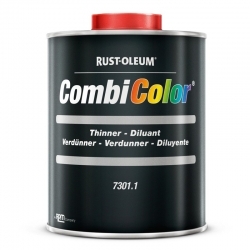 A special thinner for Rust-Oleum CombiColor 7300/7302 Hammertone. 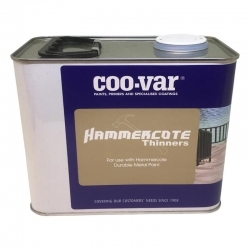 Although thinning of Hammertone is not necessary for spraying, if required it is advised to use this thinner. Also ideal for cleaning/degreasing of surfaces. 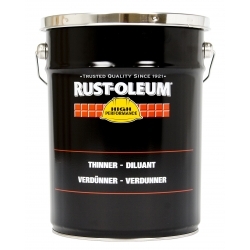 Rust-Oleum Thinner 22 is for the dilution of synthetic enamels and varnishes for airless application. Degreasing of metals and most wood types. Cleaning of 'spots' of acrylic paints and acrylic fixing paints (e.g. on glass). Used to dilute Primer 44 HS, Fassiclor, Galvaprim and Vernac. A specially formulated blend of solvents designed to mix with Rust-Oleum's 1085 Galva Zinc, 9100 High Performance Epoxy and B95 Flexible Epoxy to create an optimal consistency for application whether it be for Brush, Roller or Spray. Can also be used for the cleaning of some surfaces or equipment.